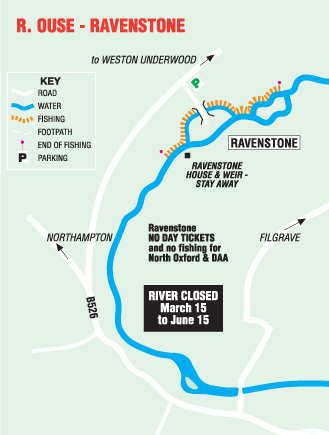 Ravenstone Mill is among the foremost big barbel fisheries in the country - let alone on the Ouse. Fish up to the 16lb mark have been reported and it's a fair bet that even larger ones are yet to be caught.But it's far more than just a big whisker water. There is good chub, certainly into the sixes, bream, monster pike and bristling perch. Downstream of the weir the river is fast and streamy (great for stalking) while the upstream length is deeper and slower and can yield big carp. Like most of the Ouse this fishery can be rather weedy in summer, but casting a bait between the weed works.